I think your rockscape looks great. Lots of space for fluffy macro-algae growth. Hi Yoshii! Thanks and luckily it's still chugging along okay. I think having a decent Bristleworm population again to work the top of the SB will help with the brown algae/cyan issues. Thank you. 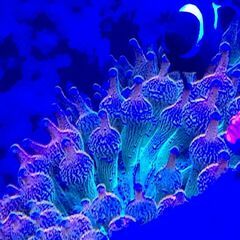 The corals started off as tiny frags and grew into what you see now over the last ten years. Thanks for asking! The only ones doing good are the Vampires. The Hawaiian Ding-Dangs just sit there closed up like bumps on a rock and the Chaos...well, looks a bit funky. I suspect that the Vamps will take over the rock eventually. to majano or not to majano? that is really my question. 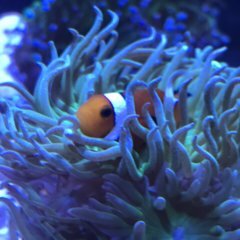 I've always liked these anemones (as opposed to Aiptasia...which get immediate eradication treatment from me), just never had them enter any of my tanks. Even if they can be somewhat invasive, I'd keep a few and just remove any that might spring up in unwanted places. For what it's worth, here's my 'theory'. When an established sand bed is removed, so are the benthic micro alga, dinoflagelates and other photosynthesizing bacteria (PSBs). En masse, these organisms sequester a great deal of PO4 (and also organic phosphate, that can be transmuted to inorganic phosphate, and visa versa, by microorganism activity). When a sand bed is vacuumed regularly, some of the benthic organisms are removed, but due to fast reproduction, the ones lost are replaced in short time. So you end up with a cycle of the system's phosphate being 'sequestered/removed/replaced' over and over that amounts to having stable low PO4 readings in the water column in an established reef aquarium. I am interested to see if enough bacteria can establish without the sand bed in your system to stabilize PO4 at a lower level (without massive water changes), or whether you will have to resort to using a phosphate remover on a regular basis. Since we only measure PO4 (inorganic phosphate), it isn't unreasonable that people can have undetectable levels with hobbyist test kits. To get the complete phosphate picture however, measuring organic phosphate is necessary (a Triton ICP test will do this). Feeding a lot should provide the needed phosphate, regardless of what our hobby test kits say. The OP's tank can be lacking in nutrients, but hard to tell without a pic and knowing what kind of fish/type of food fed/how often fed. Our sand beds do a lot of the 'heavy lifting' in regards to bacterial activity and the nitrate cycle. So the removal of it will change how the system functions. I see you are increasing your water changes to combat for increased NO3 and the corals are looking great!. You will likely see levels stabilize over time., but if they don't, you could try a ceramic block in the back chamber (or similar) to increase the surface area for bacteria to colonize. The situation is not unique for established small nano tanks. The ratio of biomass to water volume is typically quite high, hence the rapid depletion of nutrients.. For many years I was barely able to get a NO3 reading (~1 ppm) and undetectable PO4 (both Salifert kits) in a 12g with two adult Ocellaris Clownfish in it. Corals had great color and good growth, so I just rolled with it and stopped testing these two parameters altogether. Since you have pale SPS, I'd look at possibly adding another fish (primarily for increased ammonia production) assuming the two you have aren't large/very aggressive and/or reducing the water change volume. I don't have any experience with adding phosphate directly, but if carefully managed it could be another good alternative. Welcome! Looks like you've put together a nice assortment that reflects the Caribbean biotope. Your 'take it slow approach' with stocking is the correct way to go, IMO. Out of all the pest species I'd be most concerned about the Aiptasia. They sting just about everything and typically spread really fast (especially in tanks where fish are fed well). My recommendation would be to save yourself headaches later on and remove the few (or is just one?) that you have in there now. Also watch out for Mantis Shrimp if your fish start disappearing for no apparent reason. Crustaceans and mollusks are indeed sensitive to toxic metals, so you may have some contamination. I had similar difficulties (mostly with snails) many years ago in a tank with sand from the tropics (probably Philippine at that time). After checking all the equipment for rust or deterioration (there was none), I remembered a story about someone finding some type of metal object in their sand bed. Using a net that had mesh big enough for most of the sand to pass through, I sieved all the tank's sand and found a rusty fish hook! You just never know... Another thing you can do is run Polyfilter pad material. It is supposed to remove elevated levels of metals and other elements, but not deplete them entirely (small amounts of trace elements are needed for system/organism health).